Thank you, Sarah, for hosting me today with my new release Love Travels Forever, a collection of my favorite short stories and essays. This compilation is a tribute to those whose stories of inspiration and courage have touched many hearts and lives. Granted, they’re emotional journeys, and yet each one reaches out to the reader with honest and genuine compassion that I hope will be remembered long after the book is finished. In the neighborhood of my youth, Halloween was strictly for children. In small towns and rural areas, there were few, if any, Halloween parties for adults. It was simply a time for kids, costumes, and collecting candy from the neighbors. And in my eight years or so of going house-to-house in search of the cherished nugget-sized Baby Ruth or the equally prized popcorn ball, the expectation—and the result—was always the same: A smiling face, a hand extending beyond the screen door, and the reassuring plop of a piece of candy into my bag. Or in the case of old man McDougall, a ball of hard bubble gum launched at rocket speed, without any consideration to direction or specific target. There was one man, however, who celebrated Halloween very differently. Rather than carving pumpkins or covering his house with “spooky” decorations, he found a very unique and personal way to enjoy the holiday. And while he didn’t wear a costume, he did everything he could to disguise his identity. Mr. Ardell owned a small neighborhood grocery store in Bedford Heights, Illinois. I knew him because he was the father of my best friend, Kathy. His store was close to our grammar school, and Kathy would often invite me to walk there after classes to help with her “after school job.” In reality, it wasn’t a job at all, and we usually spent the time hanging out together, enjoying a soda and a donut (our moms never knew), and reading all the new comic books. For a couple of twelve-year-olds, it was a lot of responsibility. At the end of the hour, we both received a quarter for our efforts. I always enjoyed spending time in the store, and I’m sure it was because Mr. Ardell made everyone—his friends, employees, and customers—feel right at home. And although I didn’t understand it at the time, there was also something special in the way that others treated him; they not only respected him, they knew that he was, in a truthful, honest, and reliable way—a good man. A man of integrity. The same words the preacher used to describe him at his funeral. Jaye Frances is the author of The Kure, a paranormal-occult romance novel, The Possibilities of Amy, a coming-of-age romance novella, The Cruise-All That Glitters, a humorous adult satire about love on the high seas, The Beach, a sci-fi supernatural tale about a man who is given the opportunity to receive his ultimate wish, and Love Travels Forever, a collection of poignant short stories and essays. She is also a featured columnist for the NUSA SUN magazine. Born in the Midwest, Jaye readily admits that her life’s destination has been the result of an open mind and a curiosity about all things irreverent. When she’s not consumed by her writing, Jaye enjoys cooking, traveling to all places tropical and “beachy” and taking pictures—lots of pictures—many of which find their way to her website. Jaye lives on the central gulf coast of Florida, sharing her home with one husband, six computers, four cameras, and several hundred pairs of shoes. 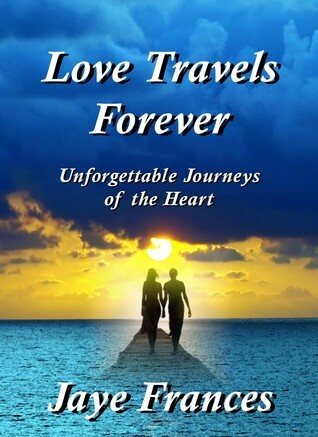 Jaye is offering one Kindle eBook version of Love Travels Forever to a lucky reader. Enter using Rafflecopter below. Open worldwide until midnight EST Nov 13, 2012.